Dripping Faucet, Lakeland, FL | A Step Above Plumbing Inc. Dripping Faucet, Lakeland, FL | A Step Above Plumbing Inc.
We can diagnose and repair your dripping faucets quickly and efficiently in Lakeland. A dripping faucet can certainly be an annoyance in your home. Not only does it waste water, but it can also leave stains and create other issues that are hard to fix. At A Step Above Plumbing Inc., we can help you resolve your dripping faucet concerns in Lakeland, Florida by providing expert diagnostic and repair services to meet your needs. The beginnings of a dripping faucet can have any number of culprits, including faulty O-rings, worn down washers, or seals that have worn out. Finding a solution for a dripping faucet is pretty important because not only can you see an increase in your water bill by as much as 10% each month, but you may also be surprised to know that as much as 10,000 gallons of water per year can be wasted. Regardless of how big or small your concerns may be due to a dripping faucet, you can rely on our team at A Step Above Plumbing Inc. to provide the solutions you need. We can diagnose and repair your dripping faucets and other plumbing concerns quickly and efficiently, leaving you with a more efficient plumbing service when our work is complete. 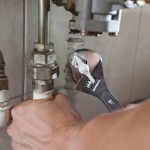 There may be things you can do on your own to address a dripping faucet, but if you cannot seem to resolve the issue, all you need to do is give us a call at A Step Above Plumbing Inc. We have extended hours throughout the week, and can also schedule weekend appointments should something unexpected occur. Contact us today if you have questions about your home or business plumbing in Lakeland.